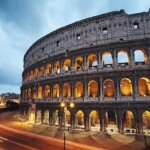 The City of Rome has a rich and colorful history stretching back more than 2,500 years – the heart of the Roman Empire from where the Romans dominated much of North Africa, the Middle East and of course Europe. 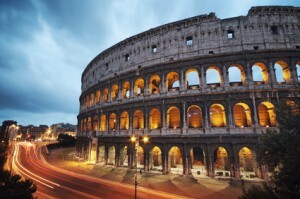 With so many fabulous historic sites and other attractions to visit in and around the city of Rome it really does make perfect sense to pick up a hire car and make the most of your visit. Offices are located in the arrival halls of both domestic and international flights for added convenience for travelers. Picking up a rental car when you arrive at Rome Airport gives you the freedom to explore this fabulous region of Italy and make the most of your visit. Palatine Hill – has incredible views across the Rome landscape with Circus Maximus to one side and the fabulous Roman Forum to the other. This site has great historic importance, according to many it was here that the she wolf took care of Romulus and Remus, the founders of this tremendous city. There are also has some terrific gardens which were originally created for one of the papal families and boast a huge selection of plants. Orvieto – Umbria Hill Town – just a short drive from Rome is this splendid example of a hill town perched on top of the fabulous tufa cliffs. The town is bursting with museums and monuments, the spectacular Cathedral boasting a splendid mosaic façade is certainly worth the journey as well as the many other attractions in this quaint town. The Sabine Hills – are just a short driving distance from Rome and make a splendid location for a day trip or a longer stay. The rolling hills are home to Renaissance palaces, monasteries and castles, hikers can enjoy the wide open green spaces and sample the extra virgin olive oil grown on the hillsides.